The 57th Venice Biennale, International Art Exhibition, titled VIVA ARTE VIVA and curated by Christine Macel, is fast-approaching. The 2017 edition will be open to the public from 13 May to 26 November at the Giardini and Arsenale venues, following a sequence of preview days. Unfolding over the course of nine chapters or families of artists, VIVA ARTE VIVA will begin with two introductory realms in the Central Pavilion, proceeded by another seven across the Arsenale through the Giardino delle Vergini. With a total of 120 invited artists from 51 countries (103 of these are participating for the first time), as well as 85 National Participations in the historic Pavilions at the Giardini, at the Arsenale and in the historic city centre of Venice, this year’s exhibition is set to be the Biennale’s largest and most diverse event to date. 1. Scotland + Venice (Chiesa Santa Caterina): Rachel Maclean will present a major new film commission for Scotland + Venice. With considerable recent success, Maclean’s work raises critical questions about identity, economy, society and morality. Through a unique and often disturbing vision, the artist creates fantasy narratives under the guise of a hyper-saturated aesthetic. Presented within a dramatic church, the exhibition will question notions of truth, conscience and power in the 21st century. 2. Diaspora Pavilion: The International Curators Forum (ICF) and University of the Arts London (UAL) present Diaspora Pavilion, a project conceived to challenge the prevalence of national pavilions within the structure of a biennale. Through the work of eight mentors and 11 UK-based emerging artists, the exhibition will expand on diaspora as a term, and forms part of the ICF and UAL’s joint 22-month Diaspora Platform project. Artists include Michael Forbes, Isaac Julien, Hew Locke and Yinka Shonibare. 3. British Pavilion (Giardini): Phyllida Barlow will present a major solo show. Best known for her colossal sculptural projects, for over four decades Barlow has employed a distinctive vocabulary of inexpensive materials such as plywood, plaster, fabric and paint to create striking sculptures and expansive installations that confront the relationship between objects and the space that surrounds them. Emma Dexter, Director Visual Arts, British Council, is the commissioner of the project, which has also been supported by Hauser & Wirth. 4. Greek Pavilion (Giardini): George Drivas explores the complexities of the current refugee crisis in the narrative film installation Laboratory of Dilemmas, curated by Orestis Andreadakis and commissioned by the EMST National Museum of Contemporary Art, Athens. The work, selected by an advisory committee, is based on Aeschylus’ theatre play Iketides (Suppliant Women), which poses a dilemma between saving the Foreigner and maintaining the safety of the Native. Addressing current global sociopolitical issues, it deals with the anguish and confusion of individuals and social groups. 5. Pavilion of Chile (Arsenale): Curated by Ticio Escobar, the Chilean pavilion sees Bernardo Oyarzún focus on the theme of the current representation of the Mapuche community, a group of indigenous inhabitants of south-central Chile and southwestern Argentina. Titled Werken, it will feature an installation of over 1,500 Mapuche masks. Oyarzún’s work often combines anthropological, social and historical elements in order to present a critique of Chilean culture and society. 6. James Lee Byars, The Golden Tower (Campo San Vio): Byars has created a new piece to coincide with the 57th Venice Biennale. Towering to a height of 20 metres, the sculpture is the artist’s largest and most ambitious work. Presented in collaboration with Fondazione Giuliani, Rome, the Venice installation of The Golden Tower is the first to fully realise the artist’s intentions of presenting the sculpture in a public space. It is part of the Biennale Collateral programme. 7. Nordic Pavilion (Giardini): A space for collaboration between the nations of Sweden, Finland and Norway, the Nordic pavilion exhibition has been commissioned by Moderna Museet, Sweden, in 2017. Mirrored features works by six artists from different generations: Siri Aurdal, Nina Canell, Charlotte Johannesson, Jumana Manna, Pasi “Sleeping” Myllymäki, and Mika Taanila. The artists map connections that override the national and regional boundaries, and seek to track a multi-faceted view of how their practice may link together. 9. Open Table / Tavola Aperta (Central Pavilion): Artists will be the guiding force behind this year’s central exhibition and they will be given the opportunity to speak about their work, every Friday and Saturday of each week of the six-month Biennale. Exhibiting artists will host an Open Table and hold a lively conversation about their practice with visitors over lunch. These bi-weekly events will be organised in two dedicated spaces refurbished for this purpose in front of the Central Pavilion of the Giardini and in the new Sala d’Armi in the Arsenale. Events will be streamed live online. 10. 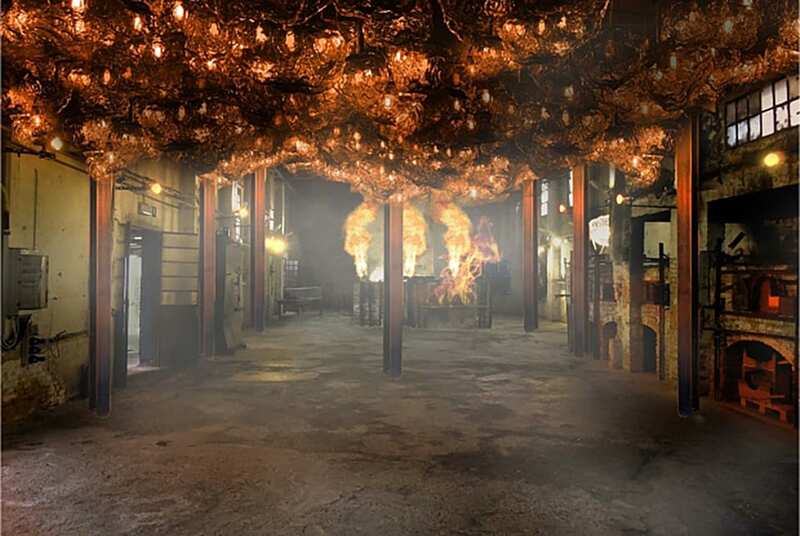 Glasstress Commission (Campiello della Pescheria): Loris Gréaud transforms an abandoned glass furnace on an island in the Murano district of Venice, a location which is famous for producing elaborate glassware. Gréaud will show 1,000 pieces made from hourglass sand within an exhibition titled The Unplayed Notes Factory. Organised by Nicolas Bourriaud, the former director of the Ecole Nationale Supérieure des Beaux-Arts in Paris, the project will take place on the Campiello della Pescheria site. The 57th Venice Biennale, International Exhibition, 13 May – 26 November, sites across the city of Venice. 1. Loris Gréaud, The Unplayed Notes Factory, 2017. 2. Phyllida Barlow, Duveen Commission, 2014. 3. George Drivas, Laboratory of Dilemmas, 2017. Openstudio Architects’ Swartberg House is the subject of a five-channel video installation at La Biennale di Venezia. Francis Alÿs is included in The Ruya Foundation’s National Pavilion of Iraq at the 57th Venice Biennale in May 2017, encompassing the notion of conflict.